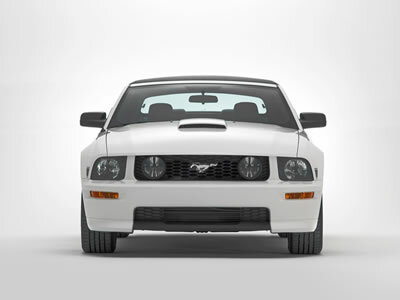 It’s all the things you want in your Mustang GT plus a little extra inside and out to make it “special.” It’s called the California Special and it will be available this summer (2006). To get the California flair you start with a GT Premium package (auto or Manual). The California Special then adds unique California Special Dove or Parchment "GT Leather" trimmed inserts and Black with Dove or Black with Parchment interior color scheme. The front and rear floormats include the special Mustang badging. Exterior accents include side scoops and unique front and rear fascias. The front fascia has a larger air intake and is actually 1.5-inches lower than the standard GT. The rear fascia is also cut differently with less tuck-in. The polished aluminum wheels are 18-inches with a bright machined rim and are wrapped with Z-branded all-season tires. Bright rolled exhaust tips and unique tape striping add the finishing touches. The California Special will be available at your Ford dealer this summer. Cost for this option (only on the GT, sorry): a mere $1,895. Exterior colour choices are limited to Redfire Metallic, Performance White, Vista Blue Metallic and Black. Valencia Yellow is rumoured to be added later in the model run.